Donald Trump crushes his GOP rivals in N.H.
MANCHESTER, N.H. — Businessman Donald Trump on Tuesday easily seized the New Hampshire primary from a host of more traditional candidates, notching his first victory and proving that he can rally an angry coalition around his call for change and convert the energy of his large rallies into actual votes. Trump captured 35.2 percent of the vote, with about 86.7 percent of the precincts reporting. The resounding victory provides strong validation to Trump’s effort to upend the Republican status quo. He now takes his swaggering, controversial campaign into more socially conservative states on the primary calendar, where he will face stronger headwinds. The closely watched battle for second place remained tight, as a pileup of establishment candidates fought to become the alternative to Trump heading out of New Hampshire. Governor John Kasich of Ohio was in second place with 15.9 percent. The rest of the field was too close to call: Ted Cruz followed with 11.5 percent, Jeb Bush at 11.1 percent, and Marco Rubio at 10.6 percent. Chris Christie — at a disappointing sixth place with 7.5 percent — said he is going home to New Jersey to await final results and determine what’s next for his campaign. Although the early results showed a late surge for Kasich, the tight grouping denied any single establishment candidate a burst of momentum coming out of New Hampshire, with none able to boast breakout strength. Instead, those candidates now face a war of attrition heading into Nevada, South Carolina, and then the March 1 Super Tuesday primary, which is loaded with conservative states in the South. 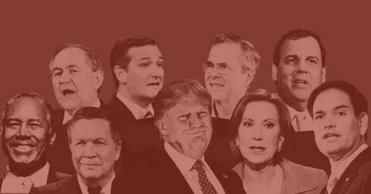 Nine candidates are vying for the GOP nomination. Find out who garnered the most votes in New Hampshire. The election was on track to set a turnout record on a cold but sunny day, and the race remained extraordinarily volatile right up until the final day, with nearly half of voters saying they didn’t make up their mind until the last week. Trump caught the GOP establishment by surprise last summer. He generated a sustained uprising in the party on the strength of his outsized personality, a torrent of insults and profane statements aimed at his enemies, and a frontal assault on Washington convention. He tapped the fears of middle-class whites about the global economy, immigration, and terrorism by singling out Mexicans and Muslims for scorn. “We are going to make America so great again — maybe greater than ever before,” he said. The billionaire casino and real estate mogul lost Iowa last week when religious conservatives handed a victory to Cruz, but Trump stormed back in New Hampshire, which has larger numbers of independent and moderate voters. Still, the structure of the crowded field worked to his advantage. The four so-called establishment candidates who fought intensely among themselves were dividing about 45 percent of the early results relatively evenly, helping Trump’s victory appear more impressive. Rather than focusing on Trump in the crucial week before Tuesday’s vote, the rest of the field unleashed negative attacks in a circular firing squad that allowed the front-runner to remain relatively unscathed. Except for Cruz and Trump, each of the other candidates now must buck history to be successful: No one has become the nominee in modern political history without winning Iowa or New Hampshire. Kasich led the pack among candidates betting their candidacies on New Hampshire. He built his campaign on appealing to independents, and he used a sunnier message, referring to himself as “the prince of light.” He held more than 100 town halls, selling himself as a pragmatic two-term Ohio governor who could work with Democrats without demonizing them. “We never went negative because we have more good to sell,” Kasich said to a crowd in Concord. Rubio’s fifth-place showing in early returns represented a quick downturn for a candidate who just days ago appeared to be closing in on the coveted second-place position. But a shaky debate performance three days before the primary, in which the Florida senator appeared rattled as he repeated the same line several times, marked a turning point. Undecided voters appeared to leave him in droves. Rubio acknowledged his poor debate performance in his concession speech. “That will never happen again,’’ he told supporters. The early result for Bush, the former Florida governor, placed him just ahead of Rubio and was likely to stoke their increasingly bitter rivalry. Several months ago, after struggling to recover from Trump’s relentless branding of Bush as “low energy,” Bush reoriented his campaign to focus almost exclusively on New Hampshire. He placed a bet that he could win voters over with substance and policy, that there would be a hunger for a more sober candidate, and that he would be rewarded for holding town halls across the state. Bush has vowed to fight on, hoping he can make a play in a state that has a history of helping his family following disappointments in New Hampshire. His father, George H.W. Bush, won South Carolina in 1988 and 1992, and his brother won in 2000. Jeb Bush’s campaign has been planning to have President George W. Bush campaign for him next week in South Carolina. Joe Habib, an 83-year-old retired engineer, voted twice for President Obama, but on Tuesday morning at the Ingram Senior Center in Salem, N.H., he said he had decided on Trump. Joe Kellner, a 67-year-old Republican, said this is the first GOP primary he’s been excited about in years. The New Hampshire primary result remained uncertain right up until the last minute. During the day on Tuesday, aides to candidates lower down in the polls were uncertain how they would fare, predicting their candidates could end up anywhere from second to fifth. Voters here are notoriously late-deciders, but on Tuesday they tested that to the limits. Some said they were unsure of how they would vote even as they trudged to the polls through slush left behind by a Monday snowstorm. In the aftermath of the Iowa caucuses, several candidates dropped out, and the same could happen again in the coming days. Carly Fiorina, who got 4.2 percent, and Ben Carson, with 2.3 percent, both had their moments in the fall but have struggled since to gain any traction. They trailed far behind in New Hampshire and may have a hard time continuing to finance and justify their bids. Christie spent more time in New Hampshire than any other candidate, making 190 stops on 38 visits. He was stymied by questions over some of his changed positions and lingering concern over his administration’s role in a scandal that shut down highway lanes and backed up the approach to the George Washington Bridge. Christie, in subdued remarks to a somber crowd Tuesday, said he is going home to New Jersey, instead of on to South Carolina, to figure out what’s next and await the final count. But his tone and his words indicated that his campaign, almost wholly premised on a good Granite State showing, is nearing its end. Perhaps the best moment of his campaign for Christie came during the debate on Saturday night, when he showed dexterity, humor, and strength in his blatant criticism of Rubio. But it appears as though that may have hurt Rubio more than it helped Christie. Cruz came to New Hampshire after winning the Iowa caucuses, and he spent most of the week stumping around the state. But his socially conservative, religiously infused message failed to resonate in a socially moderate, more secular state. He now heads to much friendlier terrain throughout the South. “Tonight has left the Washington cartel utterly terrified,” Cruz said. 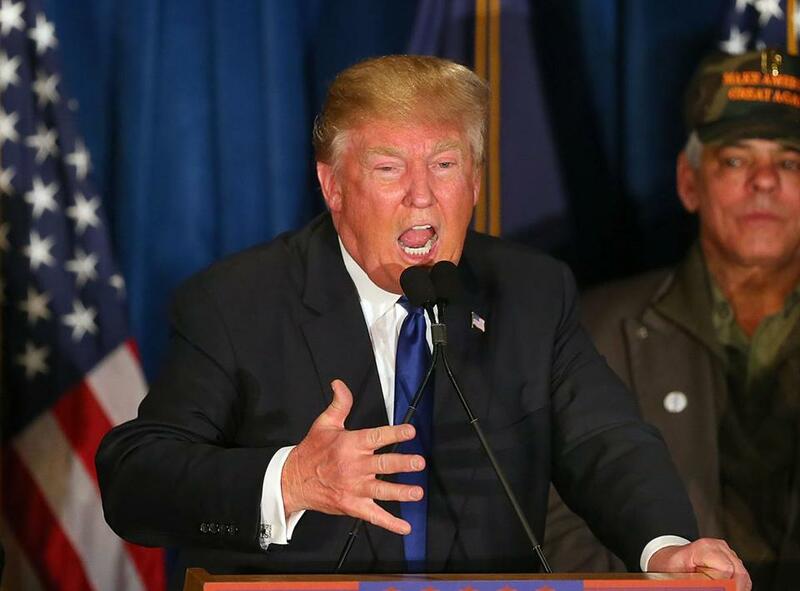 Republican presidential candidate Donald Trump spoke to supporters Tuesday. Globe correspondent James A. Kimble, and Sarah Schweitzer, Andrew Ryan, Joshua Miller, Eric Moskowitz, and Jim O’Sullivan of the Globe staff contributed to this report. Matt Viser can be reached at matt.viser@globe.com. Follow him on Twitter @mviser.